Watching the 1949 Katharine Hepburn and Spencer Tracy vehicle, Adam’s Rib, in 2018, in the midst of the #MeToo Movement, cast the film in a fascinating light, one that clarifies its weaknesses while also showing that those weaknesses are common to the genre of subversive comedies as a whole. And by weaknesses, I don’t mean the film’s outdated gender politics, although that is an undeniable element of the film. (All films of the past will reflect different social values, and holding them to today’s cultural expectations misunderstands the notion of historical context.) Instead, I mean how the film uses progressive, even subversive, commentary on society to drive its humour, and how that reliance on social commentary of the moment limits the film’s timeless appeal. In short, Adam’s Rib is intermittently funny and anchored by two titans of cinema, but whatever culturally-astute, cutting humour it might have once had looks creaky in retrospect. At least Adam’s Rib uses a brilliant conceit. It follows husband and wife lawyers battling in court and using a legal case as a proxy for their own marriage. It takes a classic “battle of the sexes” story and turns it into a literal courtroom battle of the sexes. In fact, the film could’ve easily been called The Case of Man v Woman. Unfortunately, the details of the specific court case fall short of the conceit itself. 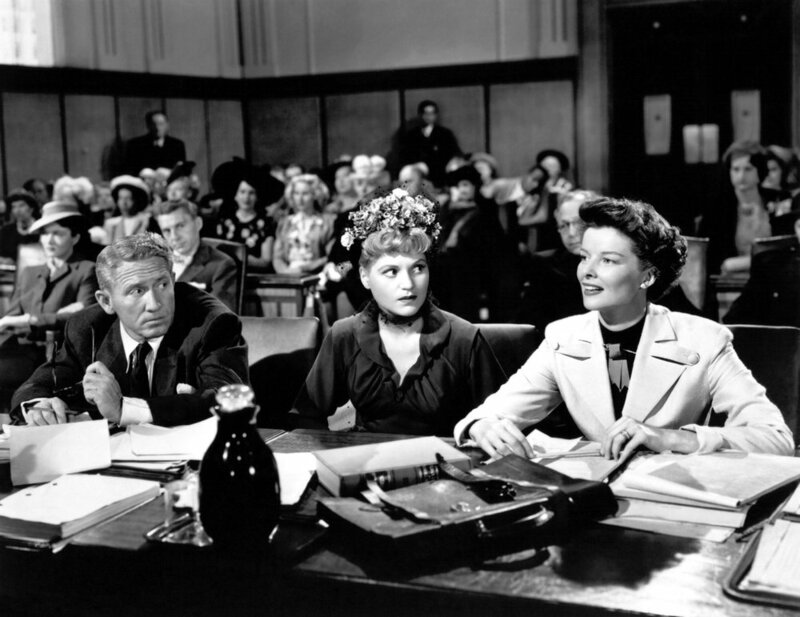 Adam’s Rib centres on the legal case of a scorned wife (Judy Holliday) who shoots her husband (Tom Ewell) when she catches him in bed with his mistress (Jean Hagen). The woman is charged with assault and attempted murder and Amanda Bonner (Hepburne) takes up her case in an attempt to strike a blow for women’s rights, which conveniently pits her against her District Attorney husband, Adam (Tracy), who is prosecuting the case. The film uses the legal case as a stand-in for society’s treatment of women in general. In essence, it asks whether it’s fair that society accepts that a man can beat or kill his wife if he catches her cheating on him, but won’t accept the same when a woman catches her husband. And there’s the problem. Adam’s Rib projects this stance as a subversive statement, one that upends the gender dynamics of society. However, we no longer live in a world where society finds it acceptable for a man to beat his unfaithful wife, much less kill her. Thus, whatever jokes are dependent on undercutting this social norm fall flat. This isn’t the film’s fault. Films are usually made for their times and comedies especially so. It’s the nature of watching the film almost 70 years later, in an age where gender dynamics have changed and where the battle over gender equality isn’t envisioned as a fight for a woman’s right to deal back blows on her husband. It’s not that the film is “regressive”; it’s that the film’s jokes are specific to a culture and lifestyle that no longer exists. It was funny because it was subversive, but because it is no longer subversive, it is no longer funny. At least there are other aspects to appreciate about the film beyond its subversive cultural statements. Hepburn and Tracy are delightful here, as they are in most films together. Every traded barb, arched eyebrow, and exasperated sigh registers as the work of a performer who intimately understands their screen partner. Even if the film’s cultural humour no longer registers, the subtler disagreements and marital arguments do. That’s why Adam’s Rib is still worthwhile; as social commentary, it’s no longer relevant, but as a film about marriage, it retains truth. I have no doubt that Adam’s Rib worked like gangbusters in 1949. It’s just that social commentary translates the least well of all comedy styles. For instance, a man slipping on a banana peel will always be funny, but a man joking about a politician or a social more will cease to land once the politician is out of office and the social mores have changed. In 70 years time, I doubt our modern comedies about Trump will fair any better and I bet many of our discussions of gender equality will seem as quaint as the subversions of Adam’s Rib. Adam’s Rib is an instructive lesson in the timeliness of comedy. The performances and dynamics of the two leads can still be appreciated and make the film a worthwhile entertainment, but whatever cultural power it once held has been obliterated with time. Directed by George Cukor; written by Ruth Gordon and Garson Kanin; starring Spencer Tracy, Katharine Hepburn, Judy Holliday, Tom Ewell, David Wayne, Jean Hagen.